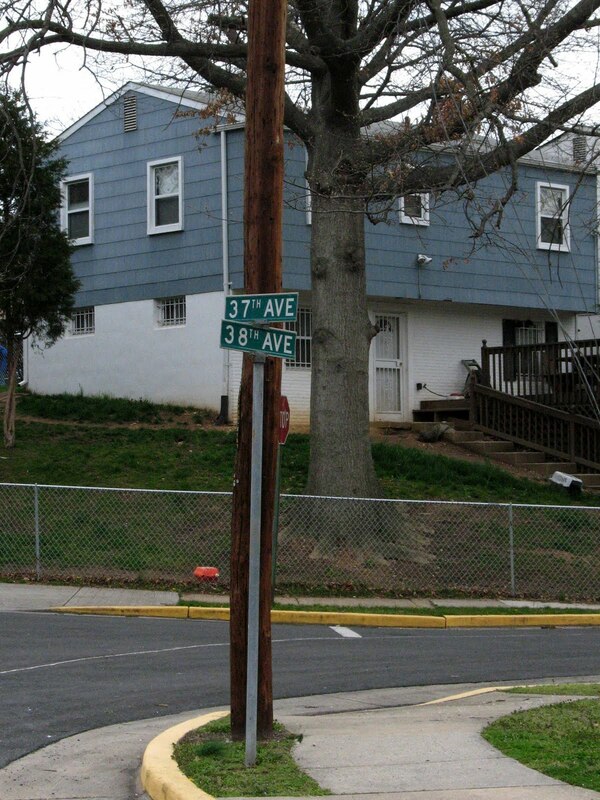 We find this 1955 historical marker on Bladensburg Road at the Maryland/D.C. line just east of the IHOP at 38th Street. 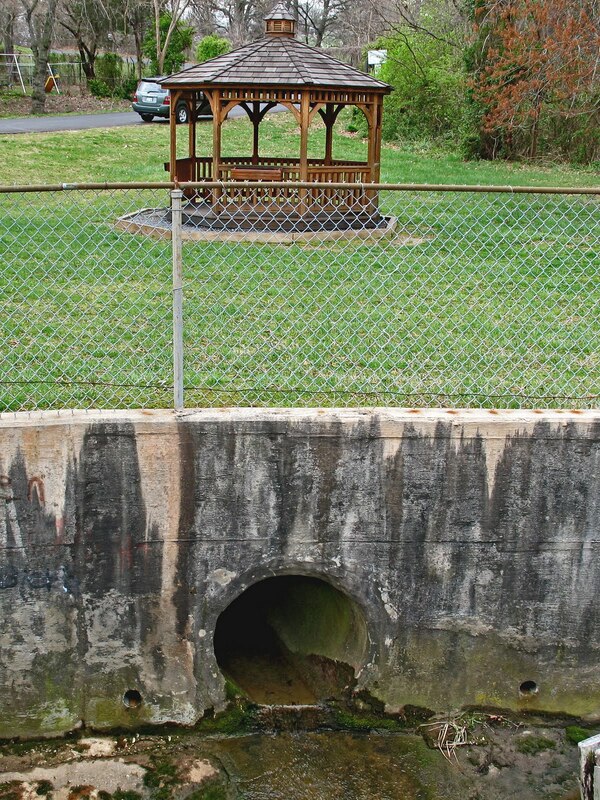 It declaims the "Dark and Bloody Grounds" where 19th century Washington gentlemen came to shoot each other. 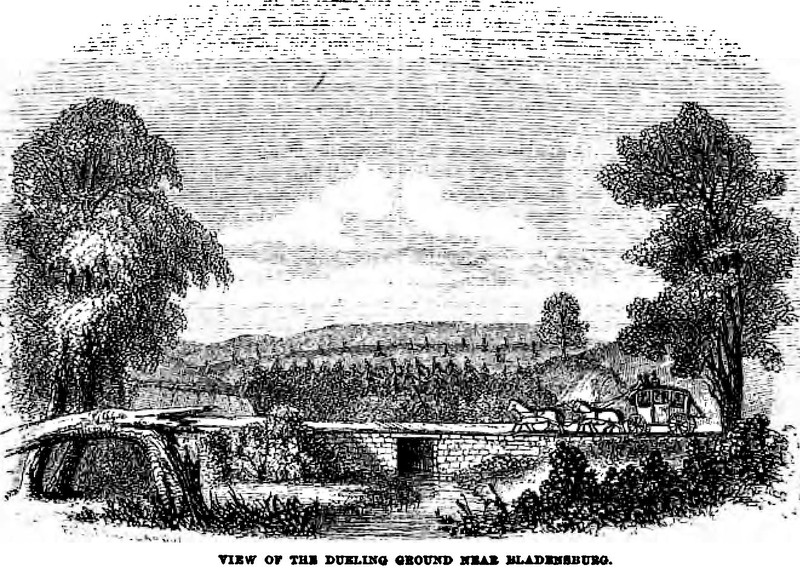 This picture from an article in Harper's Magazine shows the dueling grounds as they looked in 1858. 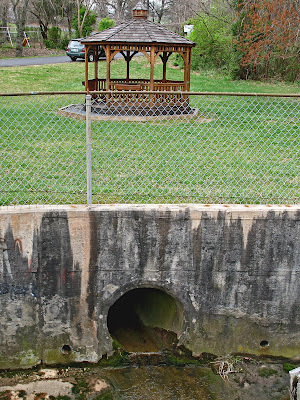 This site was in rural Maryland just outside the jurisdiction of D.C. law enforcement. The perfect place for an affair of honor. The marker claims that there were "more than 50 duels fought here." Actually there are only 26 duels known to have been fought here. 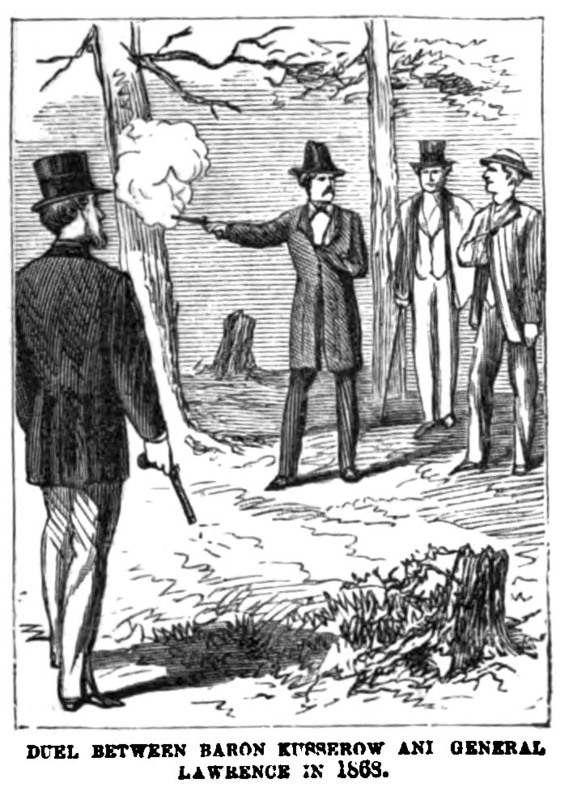 But of course there must have been many unrecorded instances of gentlemen settling their differences with firearms. 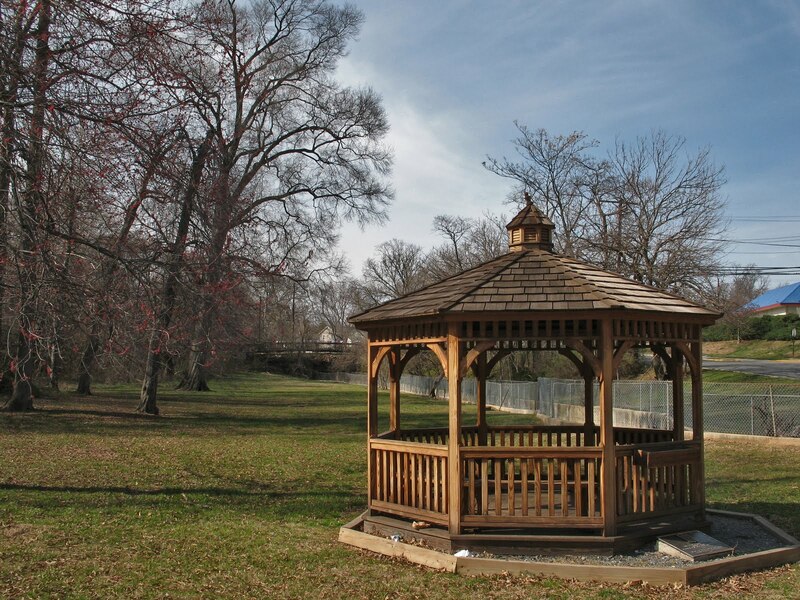 The dueling grounds are now represented by a small grassy park on the east side of Dueling Creek centered on a wooden gazebo. This spot was part of the town of Bladensburg, Maryland, until 1927 when the town of Colmar Manor was incorporated. 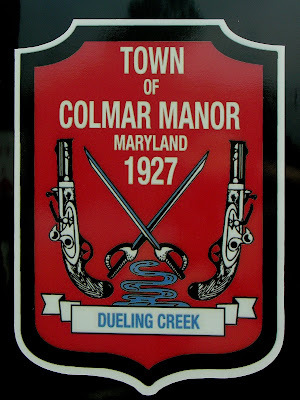 The town takes its iconography from Dueling Creek and the instruments of dueling. 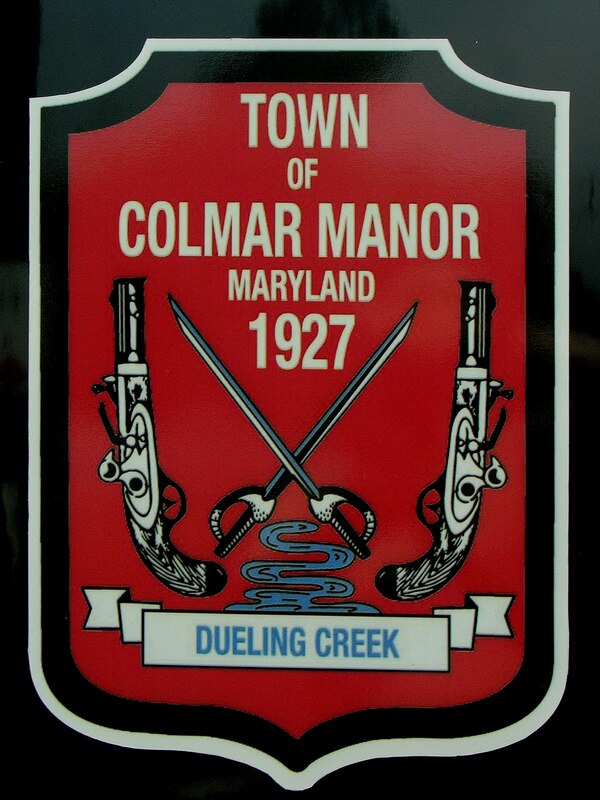 Colmar (Columbia+Maryland) is a border town with a port-manteau name of the same type as Marydel, Delmar and Pennmar. This map from The Magazine of American History shows the original lay of the land. ...and the southwest branch shown on the map now runs in a pipe. 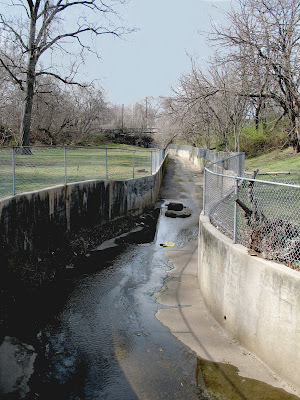 The current park does not encompass the whole of the old dueling grounds. The park occupies the southwest side of Dueling Creek from the road to a little way past the southeast branch. 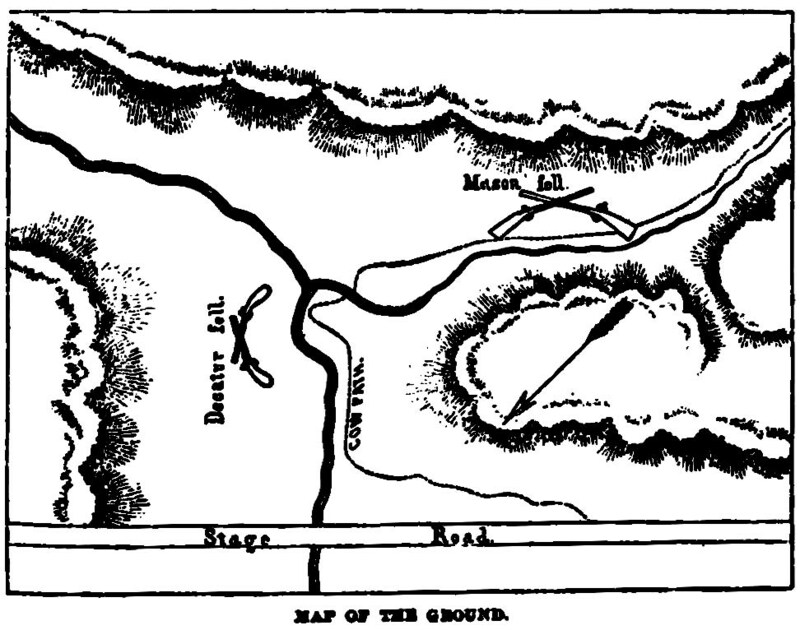 That would be along the cow path in this map from Harper's. The most famous duel fought here was the one between the disgraced Commodore James Barron and the national hero Commodore Stephen Decatur. Barron had surrendered his ship Chesapeake to the British ship Leopard in the run-up to the War of 1812. Decatur was the hero of the Barbary Wars. 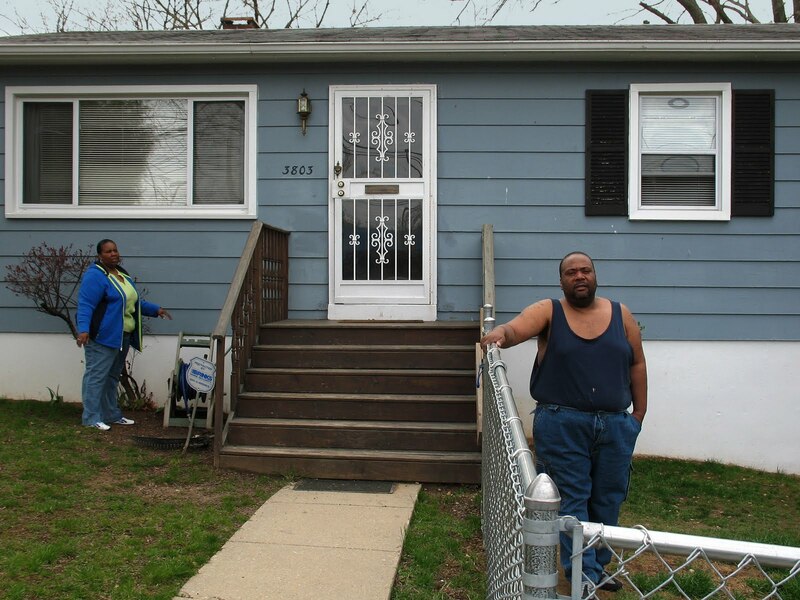 Barron and his seconds stayed at the Indian Queen Tavern in Bladensburg the night before. 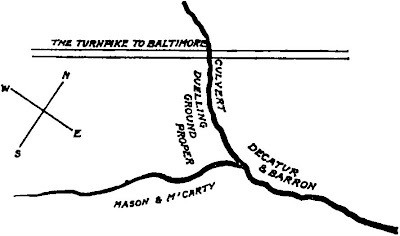 Decatur came out from his home on Lafayette Square the morning of the duel. Both men were wounded. Barron recovered but Decatur died later in the arms of his wife. 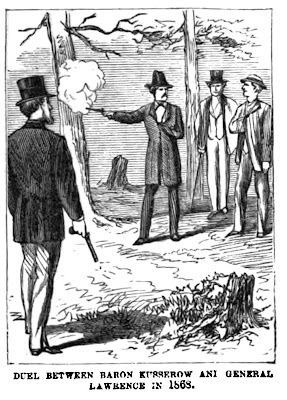 The first dual here was between two congressmen, Gardinier of New York and Campbell of Tennessee. Gardinier was wounded but recovered. 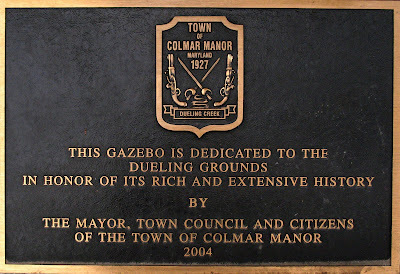 The last duel here is believed to have been in 1868, a bloodless encounter between General A. Galletin Lawrence, U.S. Minister to Costa Rica and Baron Kusserow, Secretary of the German Legation. Here's the scene as it appeared in Leslie's Popular Monthly. 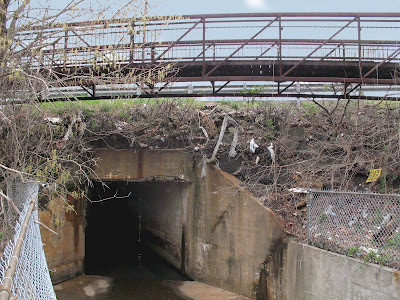 The culvert under Bladensburg Road was known in 1814 as Tunnicliff's Bridge. Here during the battle of Bladensburg, British Regulars under General Robert Ross briefly skirmished with Kramer's American Militia. 1:15 PM Aug. 24, 1814, Thornton's Light Brigade crosses Tunnicliff Bridge to attack Kramer's Battalion. As soon as they crossed the creek they fell under fire from Joshua Barney's artillery in the third and final American battle line. 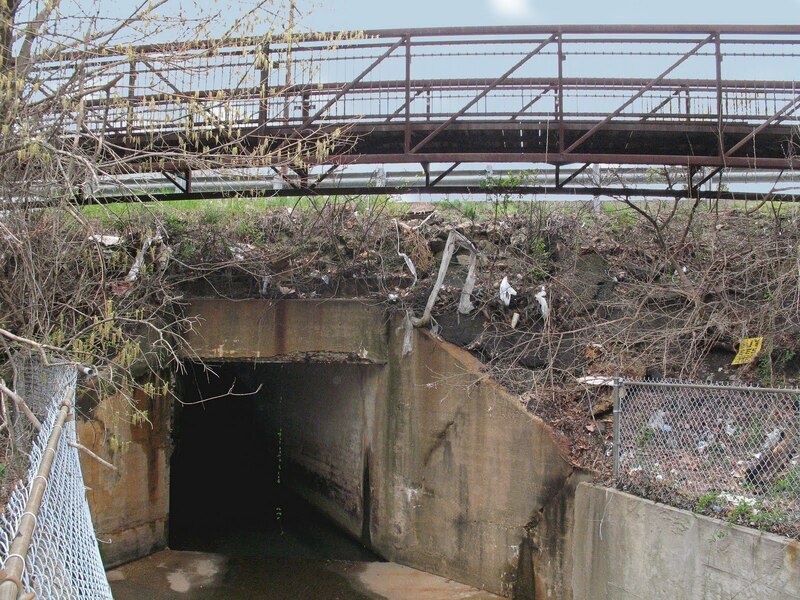 A flank attack against the American left ended the ruinous Battle of Bladensburg and opened the way for Ross to march into the Capital and burn the Capitol. After eating a meal left for them by Dolley Madison, the British burned the President's Mansion as well. They found the Mansion deserted. The Madisons and in fact the whole of the U.S. Government had fled to the Maryland and Virginia countryside. May I include a link to this blog post in a blog post that I am writing about my ancestor, Rep. Timothy Jarvis Carter. He reportedly became insane after the death of his good friend, Rep. Jonathan Cilley, who was killed in a duel here in 1838. 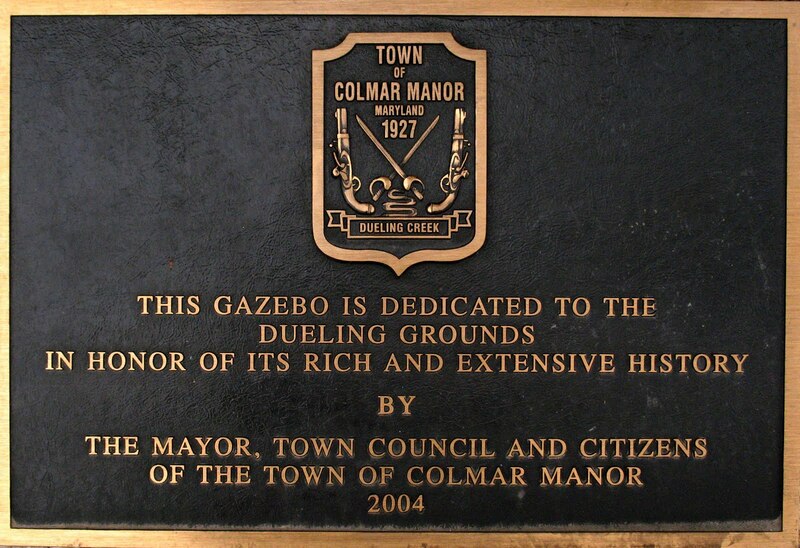 I would like to include your photo of the marker at the top of this post and link to this post as a "for more information on the dueling grounds see this post." My blog is mymaineancestry.blogspot.com. Thank you for your consideration. Absolutely, I'm honored you'd want to use my photo and I'd really appreciated a link to my post. Thanks! 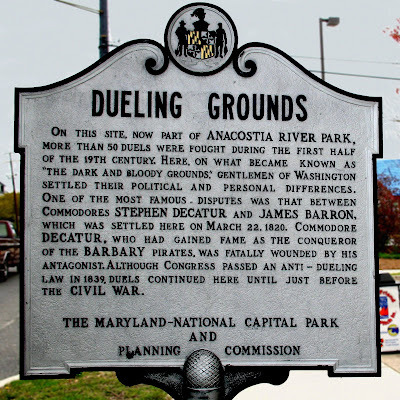 Is there any source of info like a museum or historical society that would have records on specific duels here at Bladensburg? I am specifically looking for info on Lieutenant William Arthur Lee, son of Charles Lee. He died in a duel at age 21 on or around July 18, 1817 versus an unknown opponent. I'm afraid I don't know of such records. Good Luck.